키엘, 독일의 베이직 호텔 오스트제할레 | 호스텔월드에서 예약하세요. 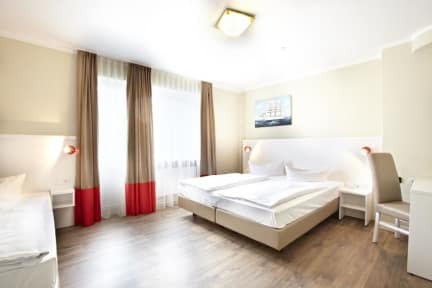 Located next to the Sparkassenarena and the shopping street Holstenstrasse, the Basic Hotel Ostseehalle is the perfect choice for your stay in Kiel. Relax in our bright and modern rooms, comfortably equipped for your needs and know that you are just a few steps away from all of Kiel attractions. The Basic Hotel Ostseehalle is situated near the centre of the city of Kiel, only a 5 minutes walk from the train station. Shopping facilities and restaurants are all nearby. We offer single and double rooms. All our rooms are with shower/wc, and TV. A good breakfast buffet is available to brighten your day. Payment upon arrival by cash, credit cards, debit cards (No Diners or American Express). This property may pre-authorise your card before arrival.